Donata’s Gift is a family holiday musical based on the Italian legend of Old Befana, with roles for children and adults. The story draws its inspiration from the Italian legend of Old Befana, the folk tale benefactor who showers Italian children with gifts at Epiphany. See synopsis. Cast requirements: two adult leads, four child leads, several lesser roles, adult chorus, and children’s chorus. Choral score with chamber orchestra or piano four-hands accompaniment. Ten songs, overture, curtain call, and scene change music. Run-time: 1 hour, 40 minutes. LISTEN TO MUSICAL EXCERPTS. For script or score perusal, rental or royalty agreements, contact Christine Kallman. Donata’s Gift was premiered at the Northfield (MN) Arts Guild Theater in December of 1998, and performed there again in 2009. The 1998 production was supported in part through a grant from the Southeastern Minnesota Arts Council. 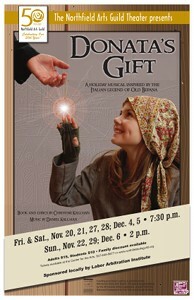 Donata’s Gift, a musical for the holiday season, draws its inspiration from the Italian legend of Old Befana, the folk tale benefactor who showers Italian children with gifts at Epiphany. In this original story, Donata is a lonely and bitter old woman in a small sixteenth century Italian village. Although it is the Christmas season, the villagers are foolish and bickering, and Donata, who is merely eccentric, is whispered to be a witch. Then, due to a mistake by the bumbling and forgetful Sister Roma, Donata is openly accused of stealing the altar candlesticks from the cathedral. Signor Alfredo, the scheming but gullible master of the orphanage who would like to impress the Constable in order to get a better job, sets out with his bullying sons, Antonio and Lino, to prove Donata guilty. But Alfredo and the town are turned upside down by the arrival of two new orphans, Lucia and her little brother Niccolo. Despite the poor circumstances of the orphans and Antonio’s threats, Lucia is not afraid to raise the hopes of the orphans that Old Befana will come with gifts and leads them in celebrating the Christmas season right under Signor Alfredo’s nose. Nor is Lucia shy in pestering Donata to assure her that Old Befana really will bring the gifts, although the girl’s hopes are dashed when she also becomes a suspect in the theft. In a dream scene, the Magi visit Donata just as they visited Old Befana in the legend. Their presence calls her to put aside bitterness and spread the gifts she has, just as Old Befana brought gifts to the Christ Child. Donata is afraid, but finally becomes convinced, in the song “Our World Needs This Child.” On the morning of Epiphany, the orphans find that Old Befana has brought them all gifts. Donata and Lucia are exonerated, and even Signor Alfredo cannot remain unmoved as the story closes. Humor permeates the play, from Donata’s clever outwitting of Alfredo by pretending to call back his dead grandmother, to Sister Roma’s fainting spells, to Alfredo’s self-important reflection on fatherhood in “Advice Song”. Other songs emphasize the play at appearances: the villagers’ pretense of getting along (“Peaceful Life”), Niccolo’s humorous show of power (“You Look Out”), and Donata’s icy exterior which masks a terrible longing (“Donata’s Lullaby”). But hope predominates, in the orphan’s joyous invocation of Befana (“Hurry, Hurry”) and the villagers’ attempts at a new start (“Something Good Will Happen”).